At the University of Chicago Medicine Cardiovascular Imaging Center, we use the most advanced noninvasive and minimally invasive approaches to see inside the heart, figure out what is wrong and determine the best way to fix it. 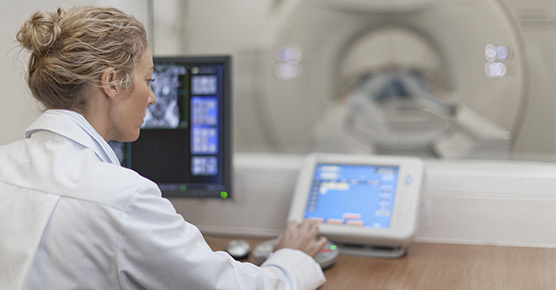 We offer the full range of advanced imaging technologies, including a powerful and fast CT scanner that produces detailed images using the lowest radiation dose possible. Our center is a national leader in 3D echocardiography, and our physicians pioneered many 3D techniques. As a result, we often have access to the most advanced equipment and the latest software before other centers. Our goal is to use the latest technology to provide the right test for the right patient at the right time. Our state-of-the-art facility features 16 imaging rooms, five stress test rooms, two echocardiogram rooms, one procedure room and five recovery bays. Our physicians have expertise in imaging or monitoring cardiac toxicity in patients undergoing chemotherapy and in safely conducting MRIs in patients with implanted pacemakers and defibrillators. Patients benefit from the close collaboration between radiologists and cardiologists with extensive imaging expertise. Our Cardiovascular Imaging Center was one of the first in the country to adopt this integrated approach. Our specialists are not only expert interpreters of cardiac imaging studies, but they also train others to perform and read the studies. Our physicians are actively involved in research, publishing 50 to 100 papers a year in academic journals. Our powerful CT scanner provides incredibly clear, cross-sectional images of the heart and its coronary arteries at the lowest possible radiation dose. A cardiac CT helps doctors diagnose disease, and may reduce the need for more invasive tests. Learn more about cardiac CT angiography. Cardiac magnetic resonance imaging (cardiac MRI or CMR) produces detailed images of the beating heart. 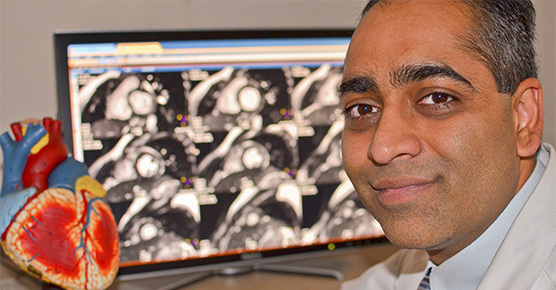 Cardiologists consider cardiac MRI to be the "gold standard" for evaluating heart function. Learn more about cardiac MRIs. Echocardiograms use sound waves to create a picture of the heart. Three-dimensional (3D) echocardiography is an advanced technique that allows doctors to see the heart in three dimensions. Nuclear tests involve the use of a small amount of a substance called a "tracer" that is injected into a vein. A special camera detects the tracer to create images of the heart that help physicians determine damage to the heart's muscle or decreased blood supply to a portion of the heart. Learn more about nuclear cardiology. Stress tests are performed to show how your heart reacts to exertion. These tests are often done while you are on a treadmill or exercise bike. 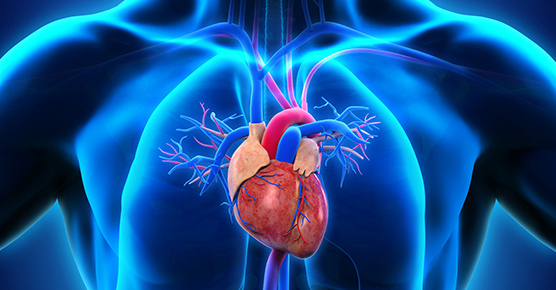 Non-exercise stress tests use a medication that mimics the effects of exercise on the heart. Stress tests are often combined with imaging, such as a stress echocardiogram, stress MRI (magnetic resonance imaging) or nuclear stress test. Cardiac imaging experts at UChicago Medicine can evaluate your risk of coronary artery disease.